When you go camping, it is important that you are equipped with the right gear, demonstrating the ability to tackle anything that is unexpected. Among others, one of the must-haves is the best camping flashlight. This is an indispensable tool to function in dark places, which is especially important for your safety. Thinking about what flashlight is best to bring next time you go camping? If you have no idea on what to buy, keep on reading the rest of this post and we’ll let you know some of the top products that should be on your radar. From the way they are constructed to their features, you can be guaranteed that they will provide the best bang for the buck. Identify Potential Threats: While it is fun and exciting to be outdoors, there are threats that could put your life at risk, such as because of stray animals. A flashlight will come in handy in terms of identifying these threats, giving you the time to respond and prepare. Self-Defense: While it is called a camping flashlight, this does not mean that its use is exclusive only for camping. Especially for ladies, it can be easily stashed in the bag. Some flashlights have extreme brightness and strobe modes, which can cause a temporary blindness and distraction. Illuminate your Path: The campsite is often dark. A flashlight will be useful when you need to go out of the tent. Also, when you are hiking at night, a flashlight is a good gear to have to easily light your way. As you try to decide about which one can provide the best bang for the buck, this section will quickly tackle some of the most important things to take into consideration. These are two of the things that should play a critical role when it comes to the product to pick. Ideally, it should be lightweight and compact, which means that it won’t add too much weight to the camping gears that you will be bringing with you. The overall construction will have a direct impact on the durability and performance of the camping flashlight. This makes it important to look at the materials that are used. The body is often made of anodized aluminum or steel. Usually, it is also coated to make it not easily prone to wear and tear. There is also a tempered glass that covers the bulb, which should ideally be shock-proof. With regards to the construction, it will also be good if it is waterproof so that you do not have to worry about using it even when it is raining. Look at the technical specifications of the camping flashlight, specifically the light output. Expressed as lumens, this simply refers to the maximum amount of light that can be generated at a given time. The best choice would be one with several settings, allowing you to choose the intensity of the light depending on what a specific situation requires. To gauge the quality of the product, you have to look at the bulb that is used. Ideally, you should look for a camping flashlight that is powered by a LED bulb. The latter is known for being energy-efficient and long-lasting. The bulb should not also generate too much heat, even when turned on for an extended period. This is the source of power of the camping flashlight, which makes it a paramount consideration. The battery should be lightweight but long-lasting. It must provide power for a long time so that you can make the most out of your flashlight. The battery will be indicative of the total runtime of the flashlight. For the best value for the money, it will also be good if you can choose a camping flashlight that can be used in different modes. This makes it versatile for different situations. You must have the option to choose from low, medium, or high lumen output. An SOS and a strobe feature will also be handy. Undecided which one can provide excellent value for money? Below are some of the products that should be on your radar. The ultimate defender – this is how the company markets this flashlight. It comes with a sturdy design, although it is compact and lightweight. There is no need to worry about being burdened by its weight when carrying it along with your camping gear. In terms of its construction, aircraft-grade aluminum is the main material that is used, which is the one that is responsible for its minimal weight while also delivering unmatched durability. However, take note that while it can withstand water splashes, this is not completely water-resistant. The zoomable beam of the flashlight is one more thing that we love about this product. To add, the beam can reach up to two football fields. This is because of the 300 lumens for its optimal brightness. More so, to make it versatile, there are three modes that are available – low, high, and strobe. The source of power is a single AA battery. Although it can last for hours, there are some people who noted that it is still not as longer-lasting as its superior counterparts. Lastly, there is a satisfaction guarantee that is offered by the manufacturer. You can get a full refund if you are unhappy in any way with the use of this flashlight. 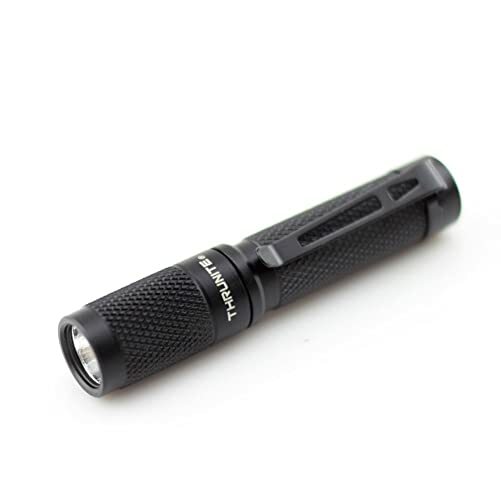 This tactical flashlight is made of lightweight and durable aluminum. There are three modes of operation and an adjustable beam. 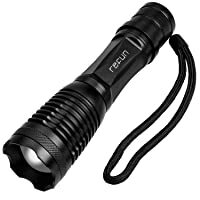 This is one of the LED flashlights that should be on the top of your list if you are looking for one that is affordable without compromising quality. Despite being an economical option, you can expect that it will be long-lasting. In fact, based on the technical details from the manufacturer, the expected runtime is more than 20 years. The flashlight is made using aircraft-quality aluminum in its body. One of the best things about the latter is its durability while being able to keep the weight at a minimum. It is also powered by one AAA battery, which does not add significant weight in the body of the flashlight. One thing that makes this perfect for camping is the IPX-8 waterproof rating. This means that you no longer have to worry about getting wet. The flashlight will also be excellent when it comes to versatility. You have the option to choose from four different settings – firefly, low, high, and strobe. It does not come with the traditional switch design. Instead, you have to twist the body to turn it on and off, which can be quite inconvenient for some users. With a twist switch, this flashlight is lightweight and compact, with an expected lifespan of up to 20 years. The body is made of aircraft-grade aluminum and it has an IPX8 waterproof rating. Stay safe on the campsite and keep an eye on your surroundings with the use of this compact flashlight. It is sleek and lightweight, which is why it can easily fit even in your pocket and won’t take too much space in your camping gears. The rugged construction of the flashlight is one more thing that is sure to captivate your attention. The tempered window comes with an innovative coating, which will be effective against thermal shock and impact. In the same way, this also improves the light transmission of the flashlight. The body, on the other hand, is made of aircraft-grade aluminum. In terms of the output, on the other hand, it has 500 lumens under the high setting, which will make the battery last for 1.5 hours only. On the other hand, with the low light output, which is only 15 lumens, the battery can last for up to 46 hours. 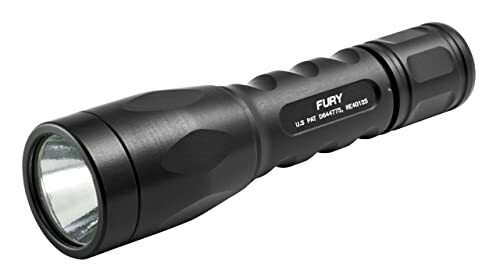 If you are still not convinced to choose this flashlight, one thing that might change your mind is the fact that it comes with a lifetime warranty from the manufacturer. 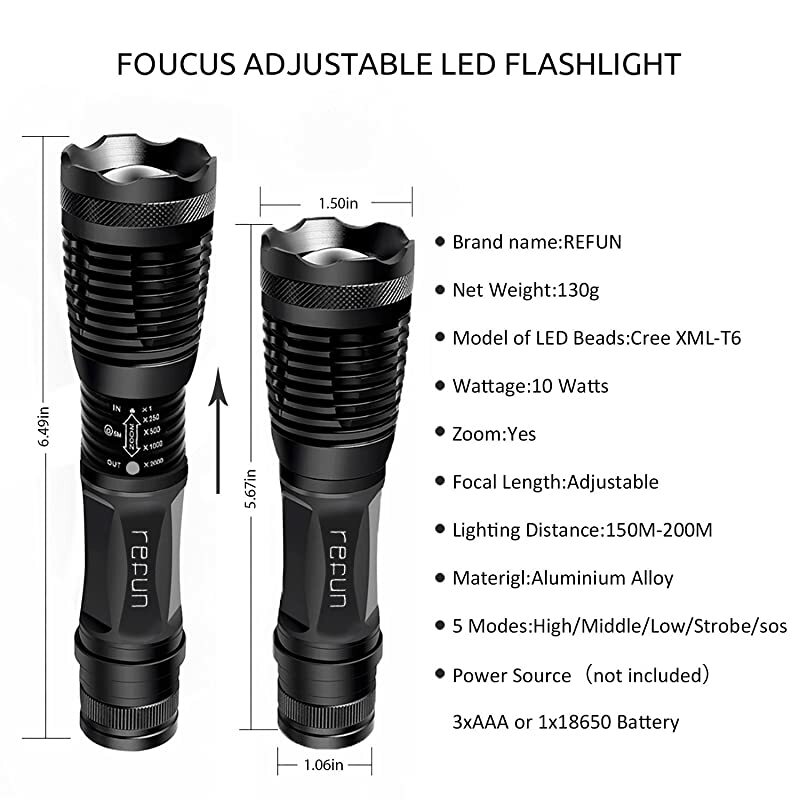 This camping flashlight has a high-efficiency LED output, a durable body made of aluminum and tempered glass, and a lifetime warranty from the manufacturer. This is the ideal option for those who are looking for an economical option that does not compromise the performance. One thing that we love the most in this product is the fact that there are five modes that can be selected based on your needs. The focus range can also be adjusted as desired. 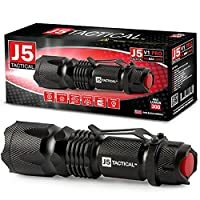 The flashlight is on the larger end of the spectrum, which makes it bulkier compared to most of the options that are mentioned in this post. With the bigger size, it may not be as handy as the others. A lot of its users give words of praises when it comes to its energy efficiency. You can expect that the battery will last for an extended period without sacrificing the light output. More so, based on the technical information from the manufacturer, the flashlight bulb has a rated lifespan of more than 100,000 hours. The body of this flashlight is made of aluminum alloy, which is lightweight and durable, although it can be quite bulky. It is also water-resistant, which is one of the things responsible for making it long-lasting. Lastly, the manufacturer is offering a lifetime warranty and a money-back guarantee for 30 days. With five operating modes, a rated lifespan of 100,000 hours, and a money-back guarantee, you won’t have reasons to not choose this camping flashlight. While this is quite more expensive compared to the products that have been mentioned above, this should not give you the reason to instantly ditch this in favor of its cheaper counterparts. Among others, one thing that we like the most in this product is the excellent output. The maximum output of this flashlight is 453 lumens. Based on the product information from the manufacturer, the approximate lifespan is more than 150 hours, which makes it provide the best bang for the buck. 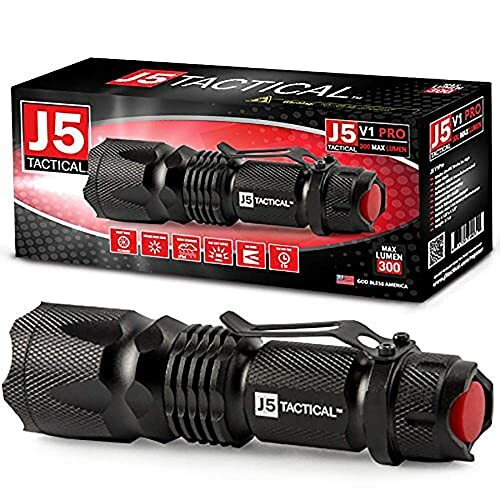 Similar to most of the camping flashlights that you can find on the market, you will have the freedom to choose from different operating modes. This model has four output levels, as well as several hidden modes, which include a beacon, flash, strobe, and SOS. When it comes to the construction of the flashlight, it is made of stainless steel and has a dark titanium coating. This is one of the reasons why it is durable. This camping flashlight delivers four light outputs and multiple hidden modes. The maximum output is 453 lumens while the average lifespan is 150 hours. To enjoy the great outdoors, it is necessary that you have the tools needed to survive and stay safe. Among others, you need to have a camping flashlight, including those that have been briefly mentioned above. They are an indispensable tool to help you navigate through the dark and stay clear of possible threats, among other things.